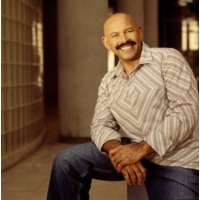 Oscar Emilio León Somoza, better known as Oscar D'León (born in Caracas, Venezuela on July 11, 1943) is a Venezuelan musician who became internationally famous for his salsa music. In Spanish, he is known as El Sonero del Mundo ("the Song Singer of the World"). His most famous song is perhaps "Llorarás," which he recorded in 1975 with his group La Dimensión Latina. He is also ambassador for Operation Smile. Oscar D'León was a long-time resident of the Parroquia Antímano section of Caracas, he took interest in bass guitar early on, and would alternate in jobs as an auto mechanic (during the day) and bass player (at night) for local conjuntos [literally means an "assembly", but represents a small musical band popularized in Cuba, whereby musicians on bass, guitar, and percussion would all sing local folk songs]. As he acquired a reputation for being a solid bass player, clever improviser (he would improvise entire songs on the spot), humorous entertainer and dynamic singer (he used to dance with a double bass onstage while singing, a not-so-subtle physical feat), he founded orchestras such as La Golden Star and music groups such as Los Psicodélicos. Together with percussionist José Rodríguez and trombone players César Monge and José Antonio Rojas, he formed La Dimensión Latina in 1972.